Kurt Sassmannshaus, violinist, teacher, and conductor, is considered one of today's preeminent violin pedagogues. Chairman of the String Department at CCM since 1984, he was recently appointed to the school's distinguished Dorothy Richard Starling Chair for Classical Violin, a position previously held by the late Dorothy Delay. Sassmannshaus has taught around the world, including master classes in Europe, the United States, Japan, China, and Australia, and has worked in close association with Dorothy DeLay both in Cincinnati and at the Aspen Music Festival and School where he is on the faculty and acts as a member of the Board. His students include prizewinners of major international competitions, prominent soloists and chamber musicians, and orchestra leaders in ensembles such as the London Philharmonic, Capetown, North German State Radio, Frankfurt Radio, Cincinnati, Pittsburgh and Cleveland orchestras. His former students also hold faculty positions in European and American conservatories and universities including Lübeck, the University of Michigan, University of Boulder, and the Peabody Conservatory. After receiving his bachelor's degree from Cologne, where he studied with Igor Ozim, Sassmannshaus received a Master's degree from the Juilliard School as a scholarship student of Dorothy DeLay, and won first prize in the International Chamber Music Competition in Colmar, France. He taught at the University of Texas, Austin and at Sarah Lawrence College before joining CCM full time in 1983. In addition to teaching conservatory students, Sassmannshaus is renowned for his method of training younger players with extraordinary talent. 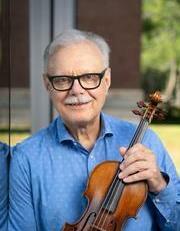 In 1987, he founded the Starling Preparatory String Project as an integrated pre-collegiate program for string players with prodigious ability. This program has earned a worldwide reputation for its unsurpassed offering of performance opportunities for young soloists, especially in the Starling Chamber Orchestra, which he conducts. In addition to a subscription concert series and concerto showcases in Cincinnati, the Starling Chamber Orchestra regularly records, commissions new works and tours internationally. They have appeared throughout Europe, Korea, China and at New York's Lincoln Center and have received rave reviews for their recordings and live performances. The orchestra was recently featured on the syndicated Public Radio International show From the Top, and has been the subject of feature articles in The New York Times and Washington Post. In 1996, Sassmannshaus expanded the Starling programs and founded "Starling Kids," a broad based community violin program at CCM and several local schools. This beginning violin program also functions as a teacher training program for college students. He is the author of violinmasterclass.com, a comprehensive website which demonstrates his innovative teaching methods. BM, Cologne University of Music, Cologne, Germany. MS, The Juilliard School, New York, NY.